Any company that is processing electronic payment transactions is typically receiving data from multiple data sources. To determine financial equivalency and resolve any discrepancies between the different data sources, a reconciliation process must occur. 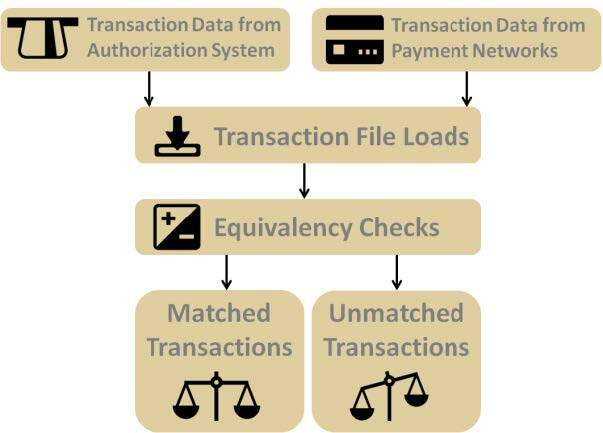 In the example below, data is being received from an authorization system and one or more payment networks (e.g., Visa, MasterCard, Discover). Since high volumes of transaction information is often being received from many external data sources and each data source may use different business day boundaries, companies are spending a lot of time reconciling transaction data. Concourse – Reconciliation is a real-time, rules-based software solution that automates the reconciliation process. It allows companies to view the current reconciliation status, net positions, suspense items, and specific reasons for any data discrepancies.